The revolutionary new patented SMART SPORT VT™ saddle is now available in Dressage, Jump and GP styles. The innovative, fully flexible gullet and impact absorbing panels have been developed using the Tekscan CONFORMat™ Pressure Mapping system. Scientific research has shown that correctly fitted, SMART™ saddles reduce peak and overall pressures. Ongoing scientific research studies using biomechanical analysis highlight that use of a flexible saddle enables the rider to maintain synchrony with the horse, achieving a more harmonious performance whilst minimising the risk of rider lower back pain. The anatomically optimised and ergonomically designed UltraContact™ seat has been developed to improve rider comfort and stability. This new design supports the weight-bearing areas of the rider’s pelvis, improving balance and reducing the risk of saddle-related injuries. The SMART™ saddle is fully deformable, and free of any rigid parts, which in high-risk performance sports provides significant safety advantages for both rider and horse in the event of a fall. The versatile and easy-to-use SMART SPORT VT™ saddle can be quickly adjusted by the rider to accommodate the ever-changing shape of the horse’s back. Rider fit is easily customised with an adjustable knee block system. "The SMART SPORT VT is fantastic! The seat and stability of the saddle are excellent; I felt a real improvement on my narrow event horse." Kadiya Qasem, Solution Saddles Technical Advisor. To book your appointment to trial the new SMART SPORT VT™ saddle, contact Solution Saddles for details of your nearest Approved Advisor. · SMART VT Dressage or Jump saddles = £100 off full price plus £100 accessories credit. 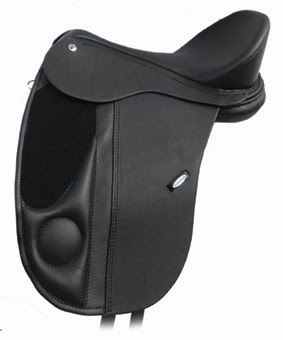 · SMART VT GP saddle = Introductory price £2350 inc VAT plus £50 accessories credit.